This sacrament is also a sacrament of ‘communion’ with the Church: it helps keep the sick and elderly ‘in touch’ with the life of the church. Perhaps the best way to highlight this understanding is the public celebration of the Anointing of the Sick. Pope St. John Paul II’s celebration of anointing at St George’s Cathedral, Southwark was one of the most moving moments of his visit to Britain in 1982. 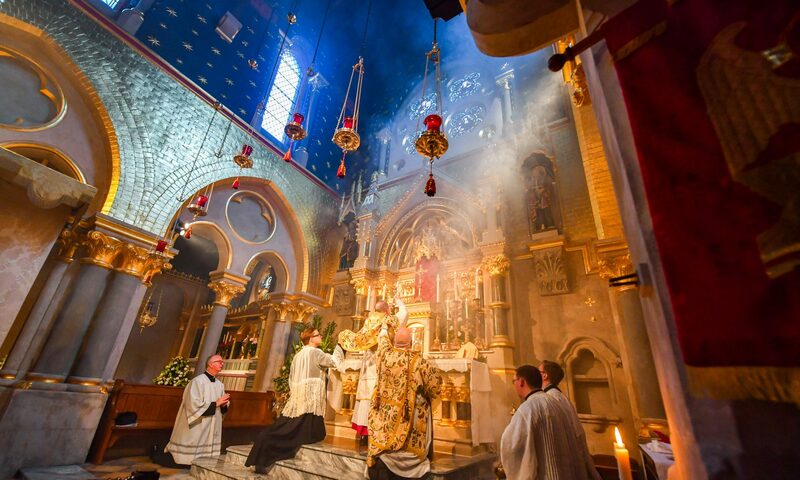 The sick and housebound are always a primary focus for the pastoral care of the Church, as they can all too easily become cut off from the spiritual life of the Church, especially from the Mass. Receiving Holy Communion keeps them ‘in communion’ with Christ and the Church, and their own life of prayer and witness is gift of tremendous richness for the parish community. If you or someone you know is in need of anointing or reception of the Last Rites, please call Father as soon as possible. This can be done at any time of day or night. The Sacrament “Extreme Unction,” also called “Last Rites” or “Anointing of the Sick,” is the anointing given to those who are gravely bodily ill, especially those in danger of death from bodily illness or from violence already done to the body (i.e., a soldier about to go into battle is not a candidate for the Sacrament; one who has been shot and lies gravely wounded or, especially, dying, is). The effects of the Sacrament are the strengthening and comfort of the soul of the anointed one, the remission of sins and some of their temporal punishments, and the possible restoration of bodily health. The Rite in which the Sacrament is offered includes the Sacraments of Penance and the Eucharist (in that order), followed by the Sacrament of Unction itself. It may be received conditionally up to three or four hours after apparent death (we can’t presume to know the moment the soul leaves the body and can only know with moral certainty that death has occurred after corruption has begun). If the sick one is unconscious, conditional absolution and Unction are offered, without the Eucharist (known at this time as “Viaticum,” meaning “Food for the Journey”). The matter of the Sacrament is the Oil of the Sick (Oleum Infirmorum), which is olive oil blessed by the Bishop around Maundy Thursday (the Thursday of Holy Week – the week before Easter).